On a recent library trip we spotted an interesting looking book Shark (Animal Diaries) and with my son’s current fascination of sharks we immediately borrowed it. It is such a brilliant book that I have since gone back and borrowed another animal diary. They are written in such a fun way that I really think even if your kids are not that into the individual animals they will still find the books interesting. The concept for this series is that it is an animal diary and each diary is written by the animal itself. My son loves this angle. You get thoughts and observations from the animals point of view and the writer has done this in such a fun way that the animals really do come to life (these books have actually inspired by son to write his own animal diary and he does not normally do fictional story writing). The books are written from the animal’s perspective so the kids learn a lot about that individual animal but they also learn about the animals that they share their habitat with, both friends and possible enemies. My son loved the fact that sometimes the animals would spell the word incorrectly and have to cross it out and rewrite it. The author has also included fact sections which are inserted like little notes stuck into the animals diary. These fact sections are very informative. And I must admit I am not a shark fan, at all, but even I enjoyed this lovely book. Both my son and I loved this little hammerhead and his friends. The second animal diary that I managed to borrow from our local library is the Animal Diaries: Spider . It is written in the same style. This time it focuses on a garden spider. My son really enjoyed the sections about the web building and actually spent some time walking around our garden inspecting areas that would make good web spots. Oh and he loves the fact that the spider calls humans “Giants”. The book introduces us to general “spider life” including who they would eat and who would try to eat them. It also deals with the life cycle of a spider. 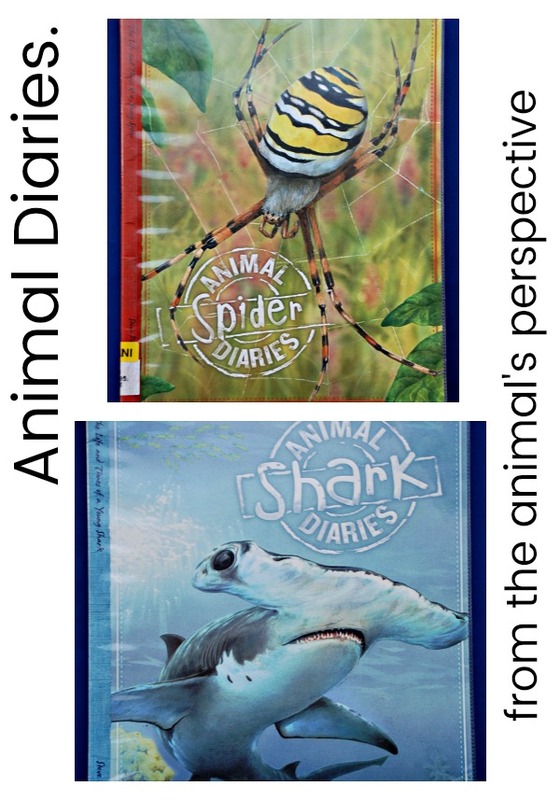 We have been really impressed with these little Animal Diary books, so much so that I am trying to reserve ALL of the other animal diaries in the series (I love that we can reserve books at our library). This entry was posted in Book Ideas and tagged animals, children's book, educational books, home ed, home education, homeschooling, nature science, sharks, spiders. Bookmark the permalink. These sound like great books! I like that it’s from the animal’s perspective. Very cool!